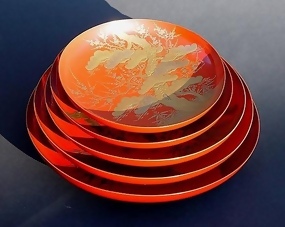 Japanese makie lacquer sake wine Dishes with an auspicous design of Sho-Chiku-Bai (pines,plums & bumboos). This design is a happy ceremonial symbol for the gold taka-makie (raised design) designs with kirigane (small gold leaf squares) on brownish red (with purple tone) lacquer. Each piece is very thin and light and in new condition. There is no wear to the gold and lacquer except one small repair on one dish. This type of set is often used as a set of three. Each dish is numbered 1 to 5 in the photos from the smallest to largest. The #2 dish has a small repair at the 3 o'clock position. The small hairline crack on the edge of the back of the largest dish #5, is also shown in the picture. The diameters of each dish are 5 3/4", 6 5/12", 7", 7 5/8" and 8 1/4".